An Advanced Interactive Voice Response is a feature that allows a computer greeting system to receive incoming calls and direct them to the appropriate department or extension. The caller can interact and navigate the menu through the telephone keypad. The customer would then dial 2 and the call would be forwarded to your respective tech help extension. By interacting with the IVR/PBX extensions, the feature takes the place of a full time receptionist. Setting up your extensions requires the pre-recorded custom greeting in audio files or dynamically generated Text to Speech (TTS) audio. Each menu prompt will provide a list of options for the caller to choose from. The caller simply responds by pressing a digit or a combination of digits. With extensions callers have a range of options and can be efficiently directed to any department or desk you program into the system, all without the need of a receptionist. Extensions can be enabled and disabled at any time. Meaning, while your staff or receptionist is in the office you can bypass the greeting system and forward the call straight to their phone. Furthermore, after hours when the office is closed you may forward the call to the IVR/PBX to allow the customer to find the information they need or reach the right extension to leave a message for. 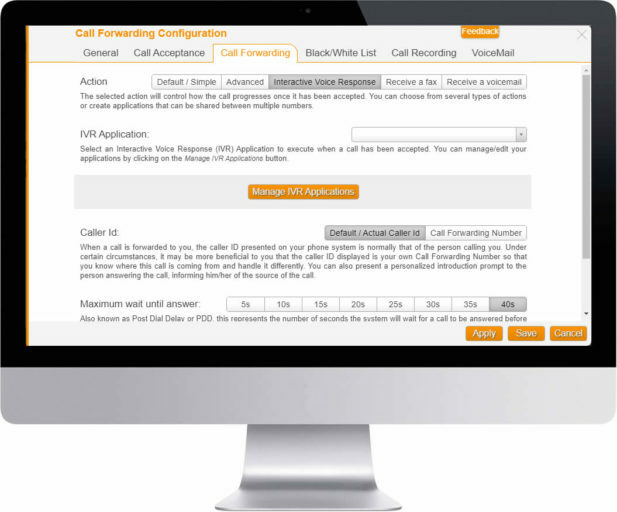 An IVR/PBX allows you to control the flow of calls and effectively manage high call volumes. When your business is going through a period of high demand for example and incoming calls are overwhelming your call center, an IVR/PBX organizes each call and initiates a que for each call to be answered as receptionists become available. In addition to this, the feature also allows you to set up a private phone system that connects incoming calls to both internal and external phone extensions. The advanced IVR/PBX feature can be used by businesses across industries regardless of size. Even a small business with limited resources and budget can benefit from an IVR/PBX system as they will not have to hire a costly receptionist. An Interactive Voice Response System eliminates the need to hire a full time call receptionist. This “e-receptionist” takes the place by forwarding calls to their appropriate extension. This system can also efficiently handle high call volumes, in turn helping businesses reduce costs and deliver excellent customer experience simultaneously. The IVR/PBX enables users to create a private phone system that connects incoming calls to external phone extensions. With this feature you will be able to answer calls on the go wherever you are. An IVR/PBX truly re-defines business outreach. The IVR/PBX is an automated system that allows callers to reach your business at any time. For example, customers who need to check an account balance or status can do so using the IVR/PBX by following the prompts and entering their account information on the keypad. An IVR/PBX saves you and your business a great deal of time. The system allows callers to quickly find the right representative they need to speak to. Customer’s frequently asked questions can be answered without even needing to speak to an employee. The advanced IVR/PBX can be programmed to provide information such as office hours, phone directory, common tech support questions and directions. Within a few prompts through the IVR/PBX, callers can quickly connect to any extensions you input into your phone system. This not only saves time for your employees, but the time of the caller too. For example, if the caller knows the extension of the employee they need to reach, they can simply dial that extension and be immediately connected. Additionally, if the caller would like to be connected to a specific department such as sales, they can press the number that connects him to that department.